فرنام, سید محمد, رضایی, فریدون, بیات آورزمانی, مهدی. (1396). مدل‌سازی مکانیک شکست گسترش ترک تراورس بتنی پیش‌تنیده در خطوط سنگین پرسرعت. فصلنامه علمی - پژوهشی مهندسی حمل و نقل, 9(ویژه نامه روسازی), 13-26. سید محمد فرنام; فریدون رضایی; مهدی بیات آورزمانی. "مدل‌سازی مکانیک شکست گسترش ترک تراورس بتنی پیش‌تنیده در خطوط سنگین پرسرعت". فصلنامه علمی - پژوهشی مهندسی حمل و نقل, 9, ویژه نامه روسازی, 1396, 13-26. فرنام, سید محمد, رضایی, فریدون, بیات آورزمانی, مهدی. (1396). 'مدل‌سازی مکانیک شکست گسترش ترک تراورس بتنی پیش‌تنیده در خطوط سنگین پرسرعت', فصلنامه علمی - پژوهشی مهندسی حمل و نقل, 9(ویژه نامه روسازی), pp. 13-26. فرنام, سید محمد, رضایی, فریدون, بیات آورزمانی, مهدی. مدل‌سازی مکانیک شکست گسترش ترک تراورس بتنی پیش‌تنیده در خطوط سنگین پرسرعت. فصلنامه علمی - پژوهشی مهندسی حمل و نقل, 1396; 9(ویژه نامه روسازی): 13-26. تراورس‌های بتنی پیش‌تنیدۀ منو بلوک از جمله پرکاربردترین نوع تراورس‌های بتنی در خطوط سنگین پرسرعت هستند. این تراورس‌ها هم‌زمان ظرفیت تحمل بارهای محوری سنگین چرخ و سرعت‌های بالا را دارند. تراورس‌های خطوط سنگین پرسرعت ظرفیت تحمل بار محوری چرخ تا 30 تن دارند و برای سرعت قطار تا 200 km/hr قابل استفاده هستند. تراورس‌ خطوط سنگین پرسرعت از جنس بتن پیش‌تنیده است. در این مقاله گسترش ترک مد I در تراورس بتنی پیش‌تنیدۀ خطوط سنگین پرسرعت به‌وسیلۀ مکانیک شکست شبیه‌سازی شده‌است. 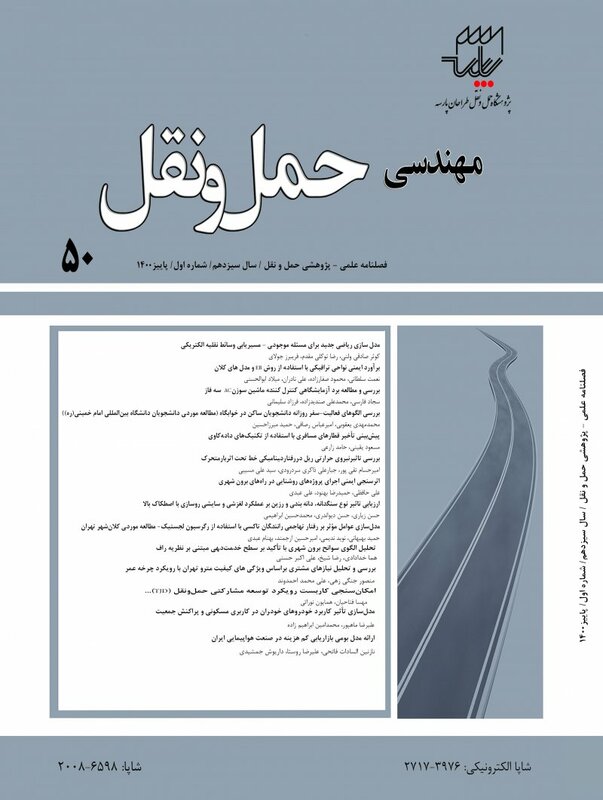 در این پژوهش، از مدل خرابی پلاستیک به‌منظور تحلیل پارامترهای مکانیک شکست در نرم‌افزار اجزای محدود ABAQUS استفاده شده است. این مدل به بررسی رشد خرابی به‌صورت غیرخطی در بتن (NLFM) می‌پردازد. مدل عددی تراورس بتنی پیش‌تنیدۀ شکاف‌دار با 6 طول شکاف اولیه صفر و 5 میلی‌متر تا 45 میلی‌متر با گام افزایشی 10 میلی‌متر و عرض شکاف 8 میلی‌متر تحت لنگر خمشی سه نقطه‌ای مثبت نشیمن‌گاه ریل قرار گرفته است. رشد خرابی، طول ترک و بازشدگی دهانۀ ترک (CMOD) در این پژوهش محاسبه شده‌است. نتایج شکل خرابی نشان می‌دهند، خرابی از محل شکاف شروع و به‌صورت خرابی خمشی در راستای شکاف اولیه ادامه و سپس دوشاخگی ترک و در نهایت خرابی نهایی رخ می‌دهد. این تحلیل نشان می‌دهد که رفتار سازه‌ای تراورس بتنی پیش‌تنیده به‌وسیلۀ مدل مکانیک شکست، به‌سادگی با استفاده از رشد خرابی، طول ترک و CMOD قابل پیش‌بینی است. -AREMA (2014) “Evaluation tests for tie systems. Chapter 30, Part 4, Concrete Ties”, American Railway Engineering and Maintenance of Way Association. -Arruda, M. R. T. and Castro, L. M. S. (2013) “Static and dynamic physically non-linear analysis of concrete structures using a hybrid mixed finite element model”, Advances in Engineering Software, Vol. 65, pp. 112-131. -AS-1085.14. (2014) “Railway track material part 14: Pre-stressed Concrete Sleepers”, Standard Australia. -Esmaeili, M., Memari, M. and Khatibi, F. (2015) “The Correlation between static and dynamic moduli in embankment of high speed railway”, Journal of Transportation Infrastructure Engineering, Vol. 1, No. 3, pp. 33-45. -Ferdous, W. and Manalo A. (2014) “Failures of mainline railway sleepers and suggested remedies – review of current practice”, Engineering Failure Analysis, Vol. 44, pp. 17–35. -Ferro, G., Carpinteri, A. and Ventura, G. (2007) “Minimum reinforcement in concrete structures and material structural instability”, International Journal Fracture, Vol. 146, No. 213–231. -González-Nicieza, C., Álvarez-Fernández, M. I., Menéndez-Díaz, A., Álvarez-Vigil, A. E. and Ariznavarreta-Fernández, F. (2008) “Failure analysis of concrete sleepers in heavy haul railway tracks”, Engineering Failure Analysis, Vol. 15, No. 1-2, pp.90-117. -Griffith, A. A. (1921) “The phenomena of ruptures and flow in solids”, Philosophical Transactions of the Royal Society London A. Vol. 221, Issue 582–593. -Kaewunruen, S. and Remennikov, A. M. (2006) “Nonlinear finite element modeling of railway pre-stressed concrete sleeper”, Proceedings of the 10th East Asia-Pacific Conference on Structural Engineering and Construction (EASEC-10), Bangkok, Thailand, August, pp. 3–5. -Kaplan, M. E. (1961) “Crack propagation and the fracture concrete”, ACI Journal. Vol. 58, pp. 596-610. -Karihaloo, B. L. and Nallathambi, P. (1989) “Fracture toughness of plain concrete from three-point bend specimens”, Materials and Structures. Vol. 22, pp. 185-193. -Koh, T., Shin, M., Bae, Y. and Hwang, S. (2016) “Structural performances of an eco-friendly pre-stressed concrete sleeper”, Construction and Building Materials, Vol. 102, No. 1, pp. 445-454. -Malvar, L. J. and Warren, G. E. (1987) “Fracture energy for three point bend tests on single edge notched beams: proposed evaluation”, Materials and Structures. Vol. 28, Issue 3, pp. 266-272. -Manalo, A., Aravinthan, T., Karunasena, W. and Stevens, N. (2012) “Analysis of a typical railway turnout sleeper system using grillage beam analogy”. Finite Elements in Analysis and Design, Vol. 48, No. 1, pp. 1376-1391. -Ožbolt, J. and Sharma, A. (2012) “Numerical simulation of dynamic fracture of concrete through uniaxial tension and L-specimen”, Engineering Fracture Mechanics, Vol. 85, pp. 88-102. -Panfilov, D. A. and Pischulev, A. A. (2015) “The analysis of deflections of pre-stressed reinforced concrete beams exposed to short duration uniform loading”, Procedia Engineering, Vol. 111, pp. 619–625. -Remennikov, A. M., Murray, M. H. and Kaewunruen S. (2008) “Dynamic design guidelines for pre-stressed concrete sleepers”, Proceedings of the 20th Australasian Conference on the Mechanics of Structures and Materials, University of Southern Queensland. -Rezaei, F., Shiri, M. R. and Farnam, S. M. (2012) “Experimental and numerical studies of longitudinal crack control for pre-stressed concrete sleepers”, Engineering Failure Analysis. Vol. 26, pp. 21–30. -Shah, S. P. and Mac-Garry, F. J. (1971) “Griffith fracture criterion and concrete”, Journal of Engineering Mechanical Division. Vol. 97, pp. 1663-1676. -Shaowei, H. u., Jun, L. u. and Xiaoqing, Z. (2011) “Study on characteristics of acoustic emission property in the normal concrete fracture test”, Advanced Materials Research, Vol. 189-193, pp. 1117–1121. -Yahyaei-Moayyed, M., and Taheri F. (2011) “Creep response of glued-laminated beam reinforced with pre-stressed sub-laminated composite”, Construction and Building Materials, Vol. 25, Issue 5, pp. 2495–2506. -Zhao, G., Prisco, M. D. and Vandewalle, L. (2015) “Experimental investigation on uniaxial tensile creep behavior of cracked steel fiber reinforced concrete”, Materials and Structures, Vol. 48, pp. 3173-3185. -Zi, G., Moon, D. Y., Lee, S. J., Jang, S. Y., Yang, S. C. and Kim, S. S. (2012) “Investigation of a concrete railway sleeper failed by ice expansion”, Engineering Failure Analysis. Vol. 26, pp. 151-163.